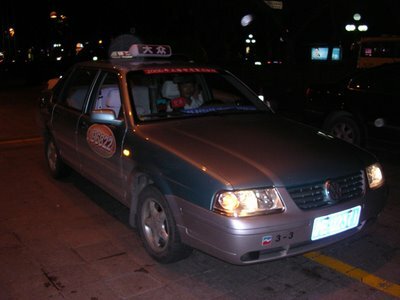 When I arrived in Shanghai the driver that WK Shanghai that had set up either didn't show or left. It took over 45 minutes to go through customs and pickup my luggage. So I had to stand in line for a taxi to take me another 30 minutes to the Regal International where I am staying. So, I jumped into a taxi. First, is the language barrier. I speak a little Cantonese, but doesn't help in this instance. Mandarin or Shanghaiese are the languages here. English is rare. Not a problem. I had a little card to show where I'm going. Point at the card. The cabbie looked at the card, smiled and off we went. The inside of the cab is great. There are white starched duvet covers over the seats. The driver is encased in clear plastic to prevent from people assaulting him. More than likely he will be wearing some nice (relatively) white gloves. The fare meter has an electronic voice to welcome you. There are quite a few taxi companies here. Generally taxi drivers do whatever it takes to get you to your place. It's just common sense to go around somebody who is blocking you. This particular driver that I chose tonight likes to flash his brights on the crowded freeway, beep the horn 3 times at a time and pass on the right. There were some close encounters, but I made it to the Regal International in one piece. The taxi thrill rides are a common occurrence.